Street art is an important part of London's character. It adds colour, humour and interest to our surroundings. It prompts a reaction, positive or otherwise, from a previously anonymous space. Every now and then, a piece of street art or graffiti takes on greater meaning. It hits a nerve, makes us think, or propels an artist to mainstream media attention. Here, then, are eight examples of what we're calling 'important' street art. Not all are works of beauty, or visually striking. But each has tickled the cortex of a million Londoners. The 'graffiti war' between Banksy and King Robbo was surely the most high-profile episode in London's street art history. The feud played out across the walls of the city, as well as online and on a Channel 4 documentary. The eye of the spraystorm centred on this canal bridge in Camden Town. Banksy defaced a 15-year-old piece by Robbo, said to be the oldest bit of graffiti in London (it wasn't). Robbo retaliated by over-painting part of the Banksy effort to reapply his own name. And so it went on, back and forth several times. 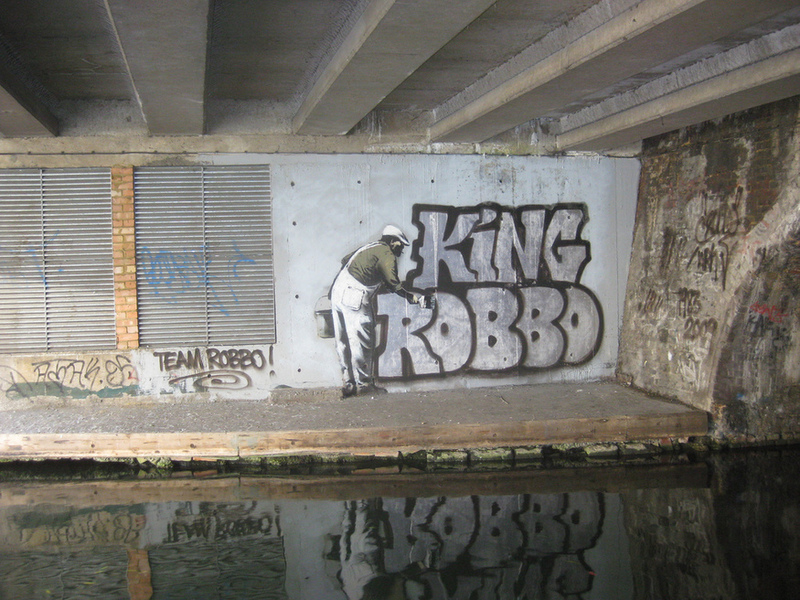 Robbo died in 2014, but several Robbo-Banksy hybrids can still be seen around town. Here's another. In March 1975, George Davis was wrongfully convicted of armed robbery. A high-profile campaign to clear his name ensued. 'G. 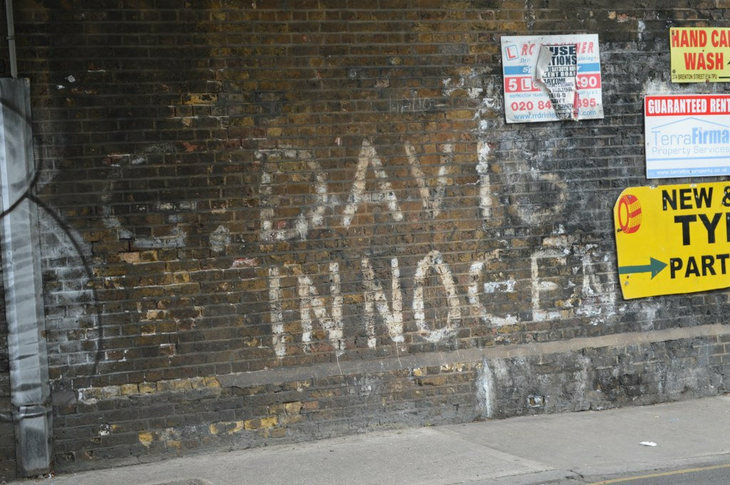 Davis is innocent' became a familiar phrase on the walls of east London. The graffiti still survives in several locations, such as the bridge in Limehouse shown above. Davis would later return to jail on more secure convictions for armed robbery. 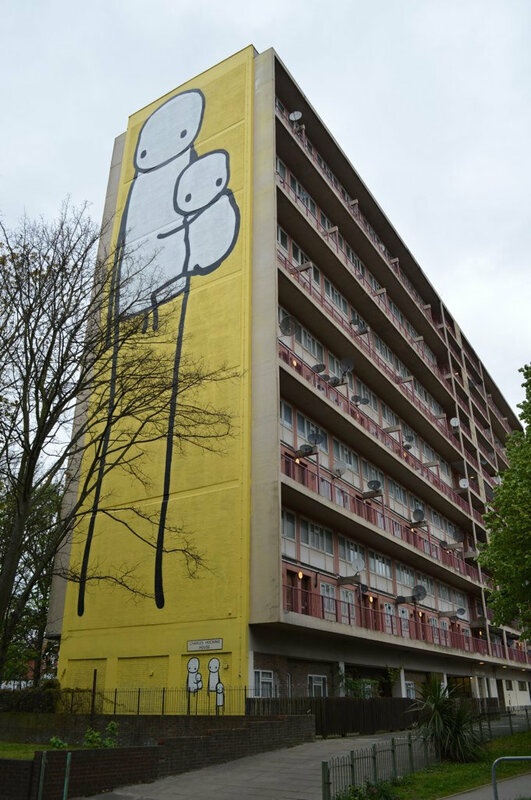 Few street artists have a style as distinctive as Stik. His handiwork can be found right across the capital, and beyond. Everybody has seen it. His most ambitious piece to date involved a 40-metre high mural on the side of an Acton tower block, painted in 2014. The bright yellow creation shows a mother and child looking down from a council estate at luxury flats, under construction nearby. It was thought to be the largest work of street art in the UK and received much press attention. Ben Eine hit the headlines in 2010 when David Cameron offered a piece of his work to Barack Obama. The alphabetically fixated street artist had been a familiar sight in London for years. 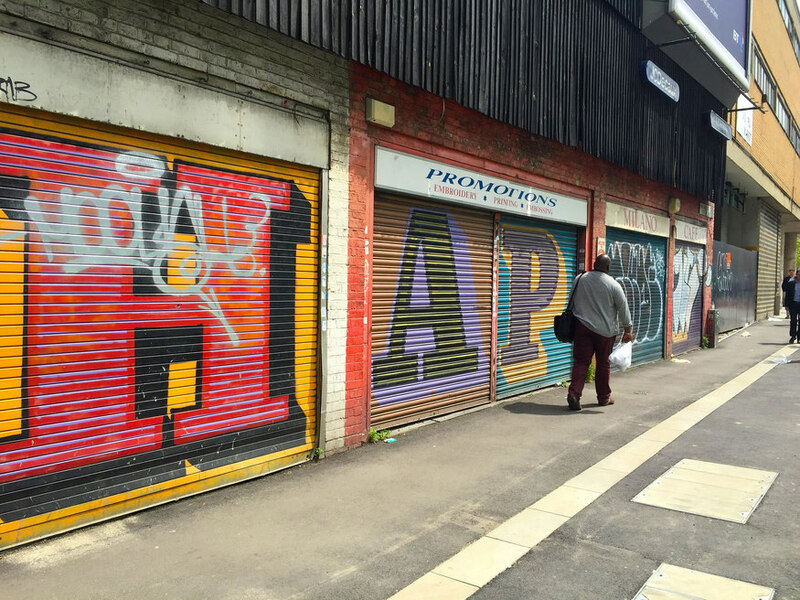 He's since decorated the capital with more eye-catching works, but he first rose to fame for painting giant letters onto shop shutters in the East End. A handful remain in the streets around Petticoat Lane. 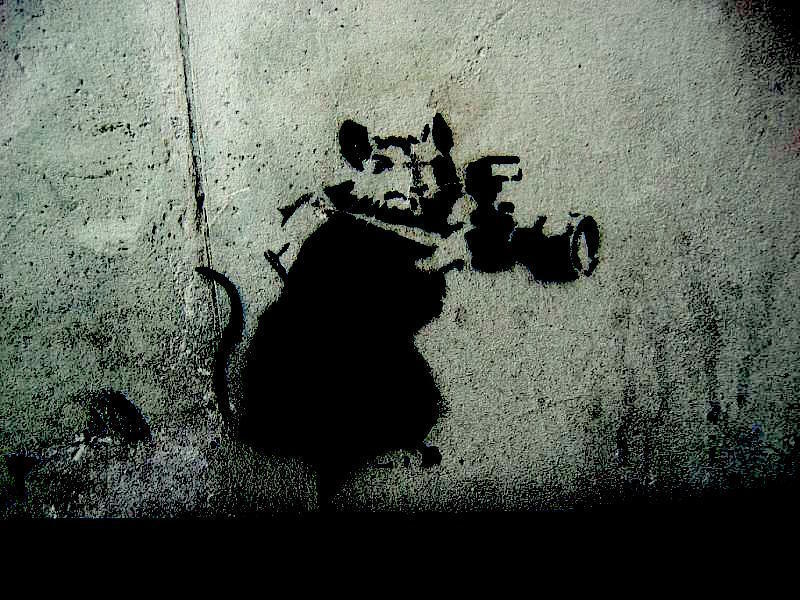 Banksy has long been a household name, famous across the world for his satirical stencils. In the early years of the century, he made his name with a seemingly inexhaustible bout of rat-themed stencils, like the one above from Waterloo Bridge. Most have now disappeared, but if you keep your eyes peeled, they're still to be found here and there. 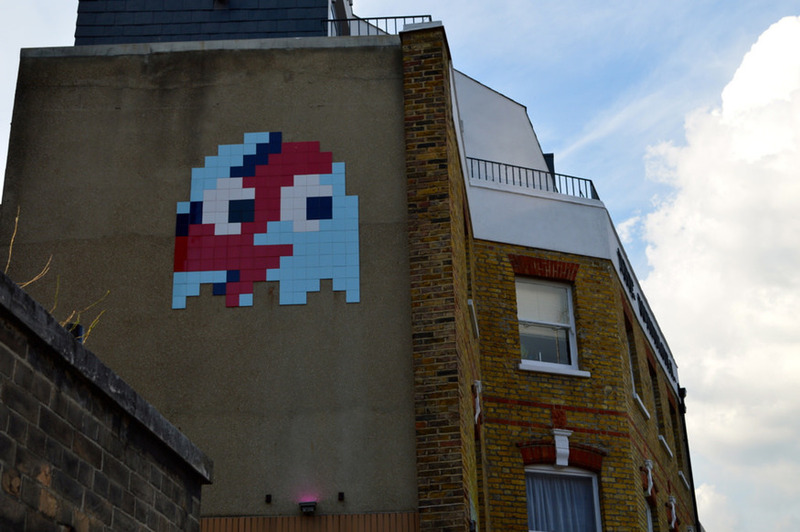 Street artist Invader is Parisian and works internationally, but he's contributed to the London streetscape on many occasions since his first 'invasion' of 1999. His handiwork is easy to identify. Typically, each piece is made up of coloured tiles to form blocky images that look like 1980s computer sprites. His ceramic wonders can be found all over town, and even inside the Museum of London. A piece in Shoreditch showing Luke Skywalker duelling with Darth Vader must be one of the most Instagrammed images of the capital. 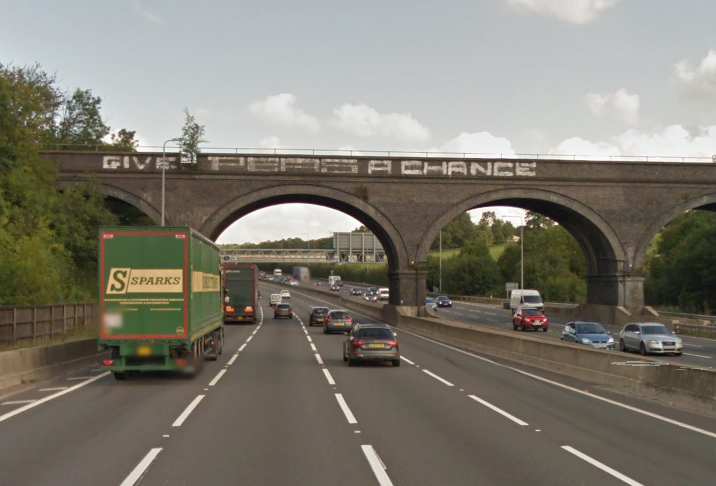 This cryptic message has bemused and delighted M25 drivers for as long as anyone can remember. Technically it's just beyond the Greater London boundary, north of the M40 junction near Uxbridge. But as this is England's premier pea-related bridge, you'll allow us to get a bit mushy about it. The slogan is actually a joint effort. The oldest bit is the word 'PEAS', the tag name of a graffiti writer. Later, someone else added the words 'GIVE' and 'A CHANCE' to form the now-familiar pun. We know this because the graffiti is referenced in an official historic building report. As if that weren't special enough, did you know that the bridge predates the motorway by decades? The railway viaduct was constructed in the opening years of the 20th century. Its arches are just the right width to accommodate a four-lane motorway. It has its own Facebook page, and everything. Image by Prophecy Blur in the Londonist Flickr pool. Anyone who regularly used the rail lines between London Bridge and Waterloo East last decade will mourn the loss of Big Daves Gusset. The apostrophe-dodging declaration added a touch of surreal humour to an otherwise unremarkable building. It provoked speculation, and even inspired poetry. 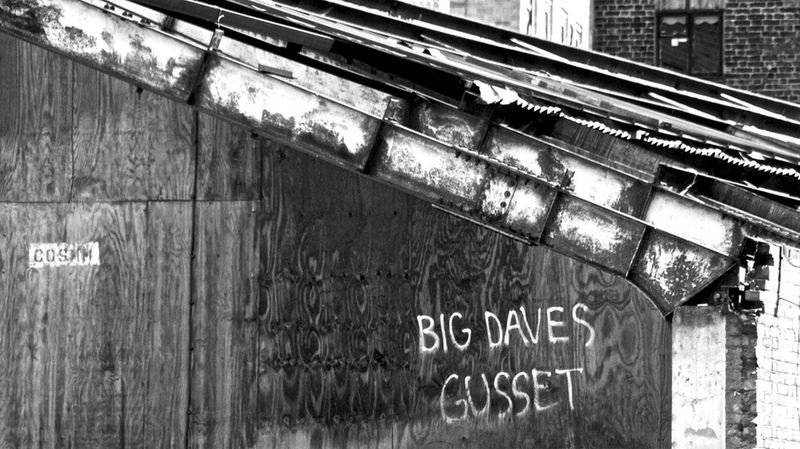 Who was Big Dave, and whence his gusset? The truth is less interesting than you'd hope. Big Dave was a plus-sized engineer on the Jubilee line extension of the 1990s. He wore distinctive underwear, much to the amusement of co-workers who shared his changing room. Sadly, the building and its graffiti have now been demolished.